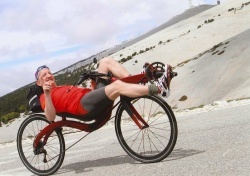 Image: Bram MoensBack in 1994 M5 designed and produced Cr-Mo Handbikes (about 60 pieces in total).The full company name in these days was like M5 Recumbents and Handbikes. Because of stupid government regulations production and sales was no longer worthwhile and was stopped for this reason. Truly a bit disappointing since this product did have potential. 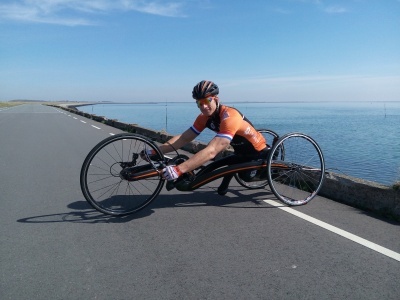 Tomorrow is an important European Championship qualifying tournament in Ostend with the handcycle in which ex Formula 1 driver Zanardi will participate as well. And he is the man to beat there. 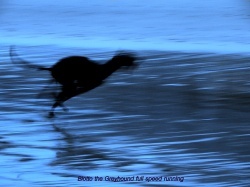 Now that Jetze has the same quality of material, he should be able to come close to the current world's fastest. Learn more about super athlete Jetze Plat? Three major M5 projects shown soon. Last year and a half we were very busy here at M5 developing new products, but for various reasons it was impossible to show these due to embargo's. Sometimes quite difficult but now they will be revealed soon and in practice immediately one proved very successful. More is shown by tomorrow! 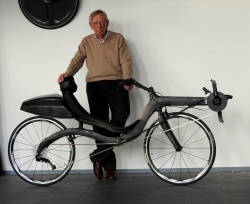 Mr. Halbertsma, only 90 years old and the latest M5 Carbon High Racer customer! So customers of 72 years, 90 years! Where are the teenagers?? For longer, multi-day distances the M5 Carbon High Racer is equipped with the latest 21 litre Carbon Tail Bag. It only adds 550 grams to the bike but helps to reduce energy input even more. The crankset has somewhat smaller rings than usual, to reduce the gear steps. With 42-11 being the biggest and 24-36 the smallest gear the range is huge anyway. We are looking forward hearing about his travel experiences! M5 CHR enthusiast Paul Worden (he's only 72) sent us a nice action image from Australia and a nice short movie! The M5 showroom is closed until january the 22nd.Phone and e-mails are as normal. Shipping and receiving of parcels is postponed until that date. The coming period will be used for oilpainting, photographing and the realisation of new designed 3D bike(parts)models. 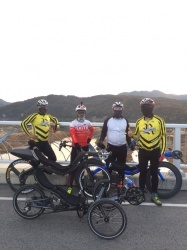 South Korea also has an enthusiast recumbent community as shown by these mainly M5 Carbon High Racer customers. 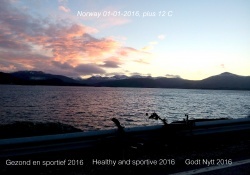 Every year we plan a week cycling holiday with some friends in May. Last year we booked a five-days vacation in Bedoin at the foot of Mont Ventoux. This is the only time that my road bike friends have a chance to beat me ... Four racing bikes from 6 to 8 kg at the start against my red M5 Carbon High Racer which just hits 9 kg. The other four are all well trained and weigh all under 80 kg. Bedoin, at the typical starting place, the fountain, to the summit via Chalet Renard is about 21 km. The summit is above 1,900 meters in the lonely desolate moonscape. Suddenly I saw a road bike that apparently knew every bend and corner up there. This had to be someone from the neighborhood, the man threw himself at every turn and made himself as small as possible. Since I did not know the terrain very well, we were on the steepest slopes fairly close together. I reached him easily and biked away smoothly when it went straight but every corner I braked much harder than him so he came back a little bit closer. After about 5 km the slope began to sink below 10 percent and the straightaways were longer. I could therefore safely let my bike do the rest and leave him behind... 107 km per hour (66.5 mph) I looked up on my Garmin GPS watch, the local boy was gone. As I waited in the village of Malaucene this guy arrived about 10 minutes later and stopped beside me. I was looking in the window of a bicycle shop and he spoke to me in French. It was indeed a local and he told me that in the past 20 years while climbing and descending dozens of times each summer this Mont Ventoux no one did ever overtook him. His nickname was apparently Roi de la Montagne which means as much as king of the mountain. Last six super neat M5 fairings available! The history of these fairings goes back to the early nineties during a collaboration between M5 and the Technical University of Delft, department aerodynamics. The performance of this fairing at 250 Watt is 72.6 km/h or 45.12 mph (level road, no wind). Besides using it as a bike fairing they are particularly suitable for schoolprojects etc. who are working on a project like thrift races. The fairings can be adapted with a little effort to a three-wheeled vehicle, whether or not supported electrically. This highly robust and neat constructed fairings are constructed of fiberglass/polyester and finished with a beautiful shiny gelcoat in light or darker sea green. The dimensions of the fairings are: 260 x 91 x 54.5 cm. (L x h x b). Weight is around 7 kg. Price per piece for this special fairing is only 650 Euro! !